Our consultation includes an evaluation of your carpet from our trained technician to determine the proper care and we will answer any questions you might have about our service. We start with vacuuming the carpet to remove visible dirt and debris. Some carpet cleaning companies might overlook vacuuming, but it is very important for proper care of your carpet. Our proprietary carpet cleaning solution is called The Natural®. The Natural® is one of the signature elements of our service and contains no soap, chemicals, phosphates, sulfates or detergents. It is green-certified and 100% safe for your carpet and your home. The key ingredient to The Natural® is carbonation. The solution produces millions of bubbles that push the deep dirt in carpet fibers to the surface. After vacuuming and applying The Natural®, HCE cleaning extracts all of the particles and dirt and transfers it to our disposal tanks. HCE is one of the best carpet cleaning methods in the industry and has several recommendations and certifications. It is one of the healthiest methods too! HCE carpet cleaning removes over 98% of allergens from carpet* (see our recent Home Health Study). The last step is to clean up our equipment and rake the carpet so that the fibers stand up and dry faster. Most of the time, carpets dry within just a couple of hours after our service. This is because we use so little water for our cleaning. 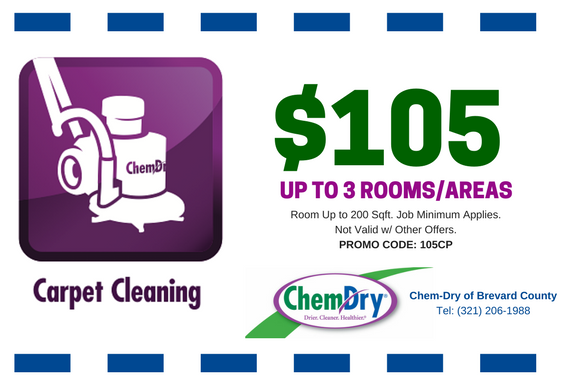 Champion Chem-Dry uses 80% less water than carpet cleaning machines and steam cleaning services! Our service includes a satisfaction guarantee for all customers. If you aren’t 100% satisfied, neither are we. Call us at (321) 206-1988 and let us know how we can help! Our carpet cleaning service removes most common stains but we do offer expert stain removal service for more difficult, hard-to-clean spots. Champion Chem-Dry is proud to provide commercial carpet cleaning for local businesses throughout Melbourne and Brevard County, FL. Our service includes flexible scheduling to accommodate the needs of your business and fast dry times so carpet isn’t wet during business hours. 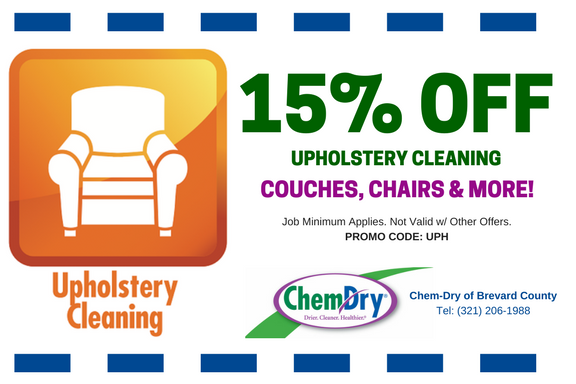 Professional upholstery cleaning for furniture, including sofa cleaning, couches, chairs and more! 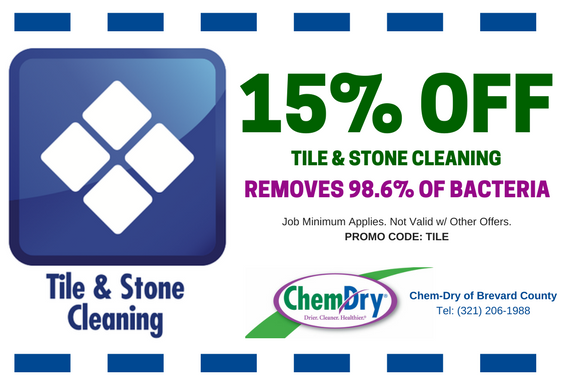 Deep tile cleaning and grout cleaning for tile and stone floors to eliminate bacteria and grime. Expert rug cleaning features proven techniques and safe solutions for area and decorative Oriental rugs. Our innovative P.U.R.T.® solution penetrates carpet fibers to reach deep urine odors and remove them. Granite countertop renewal service includes full cleaning, sealing and polish for beautiful shine. Receive pricing information from our FREE ESTIMATE form. Champion Chem-Dry was honored to receive the award for 2016 Chem-Dry Franchise of the Year. We share this award with our customers and our staff. Thank you! We look forward to continuing to provide the same excellent service in 2017 and beyond and stand by our commitment to exceptional quality and results. Follow us on Facebook: Posts include humor, recipes, DIY crafts, cleaning tips and more! Please leave a review online and let us know how your appointment with! It’s easy. Click here.